Overwhelming sadness slams into the world, the Caribbean, Grenada, the Village and me. I have not been able to write or paint for the past week. Sunk into Haiti’s devastating tragedy, I wonder how a country moves from despair into hope. Every day new stories reveal themselves on local radio stations. The latest story is of Haiti’s national football (soccer) team. Over 30 players, coaches and referees dead. Putting faces onto the inaccessible sorrow. Theo is a football coach and once played for the Grenada national football team so our northern sister island is not so far anymore. No longer is Haiti seen as a poor distant cousin in the eyes of the Caribbean region. She is now close and personal. Over two decades ago Trinidad & Tobago’s David Rudder produced a calypso that haunts us today as we listen to his words over and over on local radio stations in between nation wide fund raising broadcasts. The irony shouts loud and clear. Haiti, brave powerful resilient strong Haiti paved the way for Latin American and the Caribbean by leading the first revolt against slavery in the western hemisphere. Haiti won a ten year revolution against the French and became the first independent country in the Americas in 1804. However from birth Haiti was isolated, ostracized and denied access to world trade, finance and institutional development. According to the history books it was the most vicious example of national strangulation recorded in modern history. The Haitians were alone from inception. In 1825 the country had to find a way to insert themselves back into the world economy and thus approached their past colonizers for assistance. They were told they would be recognized as a sovereign nation however not without compensation and reparation in exchange. The sums amounted to 150 million gold francs. Haitians with their backs against the wall agreed and thus began the systematic destruction of the republic of Haiti. There are layers and layers of historical context to this tragedy. I hope one day, we as a global nation, will begin to know not only our own histories but our neighbor’s histories as well. Then can we begin to look inside one another and recognize our common humanity and our common contribution to devastation and havoc. My hope too, is that we make Haiti a teachable moment for our privileged children. May they know the historical context behind Haiti and not just see Haiti as another poor black country that the privileged kids of the West must save their pennies for. The fine line of hope and despair continues to reveal itself. Today I woke up committed to breaking this spell of sadness and moving more fully into the world. Yesterday I was sad and angry. Today I am responsible for me and how I choose to connect to this world. I remember reading about a Buddhist teacher who encouraged people filled with despair over the state of the world with wise and simple advice, “Its our turn to help the world.” Haiti’s tragedy is a wake up call for us to step forward to create positive changes in the world, through our generous offerings to an earth quake destroyed country and to our own corners of the world. I am blogging this morning in a request for collective community prayers for our nephew. JJ is going today for a second heart test to determine whether a hospital overseas will consider him for heart surgery. JJ came down with rheumatic heart disease a couple months ago. His heart was badly infected. Many say it is a miracle he lived through the infection. JJ is testimony to a life interrupted by illness and yet still ploughing forward into a different sort of life. A fragile vulnerable life. JJ is presently being sponsored by the Grenada Heart Foundation, a foundation that sponsors children and youth with heart disease and who need financial and medical assistance. The other day I was hanging with two of my soul gal friends when we started talking about poetry. We revealed our hidden thoughts about the genre. One of us said she didn’t write poetry but then minutes later said, “hold on now, maybe I do write poetry because I just remembered a poem I wrote …. Oh yes and another one…” Next soul friend revealed that she wrote poetry which had us squealing with delight! And I shared my own reflections of poems lost and found, read outloud and hidden in the folds of my journal. That same evening i found a large letter waiting for me on the table. It was a newsletter from an organization i am a part of. In the newsletter there stood a poem of mine. First poem ever published. Synchronicity strikes. I thought I would share it with you. Dedicated to children worldwide and to my two soul galfriends! As I prepare this blog I think of wrapping my arms around the whole of Haiti may they continue to find strength, courage, and resilience in yet another atrocious test of these very virtues they are testimony too. In love and solidarity. M.
Puppy, Palo, Brother, Shake, Coco, and Tricksy are the names of the dogs we have lost to poisioning over the years. Palo was the exception, he was shot last year when a farmer caught him and another dog chasing his sheep. I have not doubt the sheep would have been killed if the gun didn’t go off. Palo was chasing after and about to kill a neighbour's livestock and his livelihood. I was grateful Palo died a fast death and not the usual torturous death by poisoning. there are many reasons why dogs are poisoned regulary here in the Village, such as: people getting fet up with being accosted by dogs on the road while walking, biking, and or runnning; dogs chasing and biting up people's livestock like chickens, goats, sheep; some people poison for revenge, a dog for a dog. Last week a set of village dogs were killed because someone lost his/her patience and set poison on consecutive nights. Both our nieghbours' dogs were killed causing much grief as both Rambo and Spider were survivors of other hard ailements that dogs face here like the skin disease, mange or abuse of other forms, ie. spider survived being chopped by cutlass on his back, and a lash of stone to his head by unidentified people. Theo and I are also guilty of planning a poison attack after our goat Gabby was attacked by a small pack of dogs in the middle of the night a few years ago. By the time Theo and I jumped out of bed Gabby had already been punctured with teeth marks in her belly and legs. She then spent three days and nights underneath our house bawling in pain until she died on the third day. We thought the vet had cleaned her wounds and she was on the mend. But she was dying not mending. We hated those dogs and talked about purchasing poison and rolling the bright pink poisonous pellets into bread and throwing it to one of the dogs who we were sure led the pack. In the end we did not succumb to our anger and used the poison to get rid of the rats instead. But we did get so far as to buy the poison. I guess my point being there is a fine line between the poisoner and the owner of the poisoned. 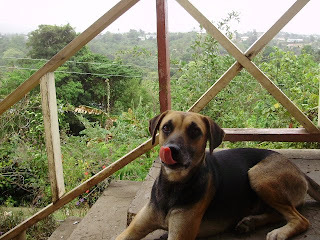 We also have watched our past dogs die a slow excruciating death by rat poison. We were able to save one of our dogs, Cocoa the first time by pouring a jug of sugar water down her throat and watching while the pink pellets poured back into the world. However she was killed three months later by poisioning again. I was tempted to put big notice on telephone pole in front of the suspected dog poisoner's house which read “beware dog poisoner in the area” I didn’t because I wasent sure it was him. I am not sure why there is not more community discussion about this problem. For example finding alternative solutions then killing each other's dogs. Perhaps fear of confrontation, false accusations, built up anger over the years. Perhaps there is so much more to fret about then dogs being poisoned like how to keep moving forward in these economically hard times. For now we keep our dogs tied in the night and pray they do not bite anyone or kill anyone's livestock when they are not tied. I also find myslef reflecting on the layers that run deep in all of us and why we do what we do when faced with anger and injustice. The Harford Village Peace Workers, a community based group from Harford Village, formed last year in reaction to the rising violence in our community. The group believes the cycle of violence in our community and society can be reversed by providing and teaching kids the opposite of violence - peace, love, compassion, empathy and respect for oneself and others. The Community Group believes teaching living values and peace building skills should be part of children and youth’s everyday learning within schools, families and communities. We have been coordinating and facilitating child and youth positive programs both here in the village and with a few schools in St. Andrew’s over the past year. At one point three boys began play fighting while provoked by another set of kids sitting close by. One of the older kids in charge of provoking saw me walk towards them. I hear her say, “Watch Maureen coming to break up the fun.” She was surprised when I responded, “So you feel I’m going to let peace kids turn confusion kids?” Everyone laughed and the boys untangled themselves while the next race was called. Theo and I sat on the veranda in the evening watching the moon rise and sharing the day’s memories. Felt great to be focusing on the strengths, and talents of the village youth which is too often buried by stories of violence and hate. Theo and I agreed on the power of praise, appreciating one another’s talents and enabling kids the space to shine! Changing small corners of the world one positive comment at a time!